The first people lived without any kind of shelter, huddling under trees when it rained. They didn’t have houses. 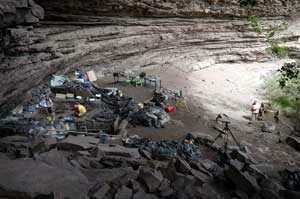 After five million years of that, though, they started to make fires and live in caves or rough shelters built from tree branches. That was about a million years ago. By the New Stone Age, or the Neolithic, some people had started building houses for themselves (although a lot of other people continued to live in caves). People began the Neolithic at different times in different places, so that people began to build houses in Sudan and Egypt and West Asia probably about 10,000 BC, and in Greece about 6000 BC. People didn’t start to build houses in England until about 3000 BC. By around 6000 BC, with the invention of spinning and weaving, some people also started to live in tents. 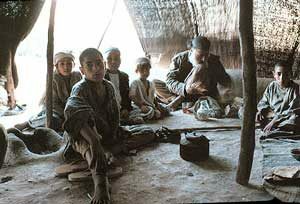 Some people, like the nomadic Bedouin or cattle herders in Mongolia, still do live in tents. The type of house people built depended a lot on where you lived. In northern Europe, and in northern China, where it was cold in the winter, people mostly built what we call “hearth houses,” which were huts with one square or round room, and a fire on a stone hearth in the middle, with the smoke going out through the thatched or shingled roof, which slanted so the rain and snow would run off. Often people kept animals right in the room with the people, for warmth. Sometimes the huts were bigger, and had two rooms, one for the people and the other for the animals. (though some of the animals, like dogs and cats, probably slept with the people, and some of the people, like slaves, probably slept with the animals). In Egypt and West Asia, and in southern China, on the other hand, it was hot most of the time, and wood was very scarce. People there mostly built houses of mud-brick, and the houses were mostly a wall around an open courtyard, with some small rooms built around the edges of the courtyard to keep stuff in and to go into when it rained (which wasn’t very often). These are called “courtyard houses.” Here the animals lived in the courtyards, which often had a well or a cistern in the middle to collect water. The roofs were usually flat, so people could sleep on them and keep cool. Many people lived in houses just like one of these all the way through the medieval period. 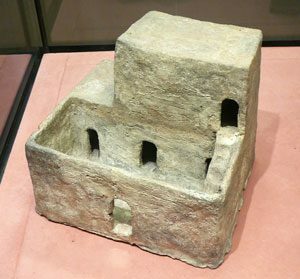 But by about 3000 BC some people in the Eastern Mediterranean and West Asia were richer than others, and began to build better houses to show it. 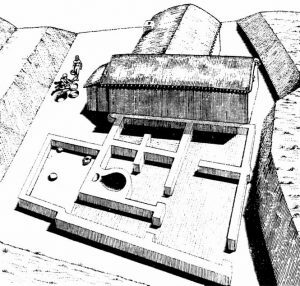 In Ur and Uruk, there are palaces for the kings: these are mostly bigger versions of courtyard houses, with many courtyards and rooms all around each courtyard. In Greece, people began to build “megaron” houses, with one or two rooms and pillars in front making a porch; sometimes in back too. These bigger houses also have nice brick floors, and built-in benches and cupboards, and painted walls, and tiled roofs. But not very many people had them. Most people still lived in the same old kinds of houses. By about fifteen hundred years later, around 1500 BC, many city-dwellers in Egypt and West Asia had these nicer courtyard houses. In Crete people built “agglutinative” houses (glued-together), with a lot of small rooms crowded together around courtyards. 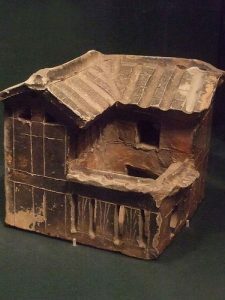 In China, rich people lived in bigger houses with pillars and tiled roofs beginning in the Chou Dynasty, about 1000 BC. Did you find out what you wanted to know about the history of houses? Let us know in the comments! What about Greek and Roman houses? Cite this page: Carr, K.E. Houses – History of Architecture. Quatr.us Study Guides, May 24, 2017. Web. April 19, 2019.